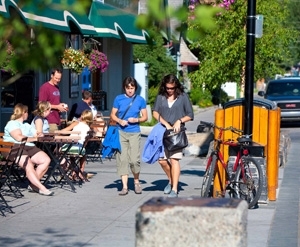 Businesses can take advantage of rebates and incentives offered by the Town to Banff to improve the environmental efficiency of commercial properties. Innovative technologies are available to help you reduce energy use or plan for future energy efficient upgrades. Take advantage of these opportunities to lower your utility bills, reduce energy use and reduce the volume of greenhouse gases emitted. Replacement of Energy Star Windows only qualifies for rebate where the glass frame and sash have been replaced. The Town of Banff's commercial energy use rebate program includes a rebate to help cover a portion of the costs of pre-project energy audits. Qualifying businesses will receive a rebate for a third of the cost of audits. The energy savings identified in the audit may be eligible for further funding from the Government of Canada. Reduce water use at your business to lower your utility bills, reduce your impact on groundwater sources and reduce the volume of water treated at the waste water treatment plant. Please complete and submit the Commercial Environmental Rebate Application (PDF).